Dharma is how we can come to die professionally. What did mean by that? 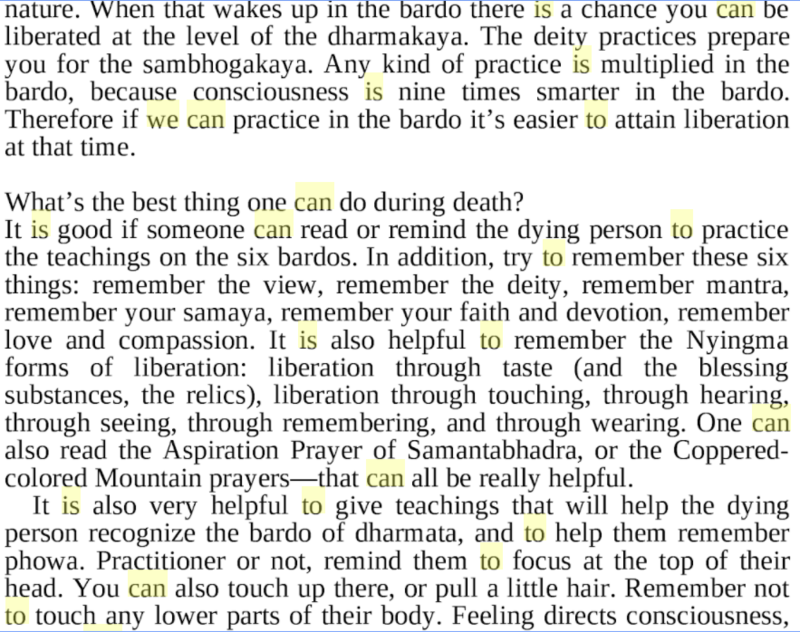 How does dharma help us during the death process? Is Tibetan Buddhism (Nyingma tradition) quite focused on death, rebirth, post-death existence? At a time in my life when I'd read almost nothing else about Tibetan Buddhism, I'd seen pictures of the Wheel of Life, and heard there was a bardo, and read a translation of the Bardo Thodol. Grateful for the support he's had (during life), from lamas and lineage. I think you can see there all three meanings of the word "professionally" -- i.e. "well", and "with training", and "as part of a cooperative social contract". The untrained mind, i.e. a mind that has not been subjected to systematic, continual practice, development and purification, can be classified as an "amateur" mind. It does not know how to deal with physical or mental objects such as pain, ill-will, greed etc. It is therefore more likely to cling in the event of death, thereby leading to rebirth. A trained mind that sees clearly with no obstructions, has insights into the true nature of reality, knows how to deal with conditioned phenomena and has consistently been trained in meditation, is a mind that is more likely not to cling in the event of death. The trained mind will be able to merely observe what happens in the death process, thereby liberating itself from Samsara. That mind can be classified as a "professional" mind. By meditating on impermanence, death, not only that death is going to happen at some time, but especially that the time of death is uncertain, by making the mind familiar with that you always have this mindfulness of impermanence, death, that this lifespan is very short. So instead of thinking, “I’m going to live very long,” that concept of permanence that “I’m going to live for a very long time” that rises even on the same day that you’re going to die, the same day that you’re going to have a car accident, or airplane crash or heart attack or whatever, a situation in which one is going to die. Even on the day that one is going to die this concept that “I’m going to live for many years” is there in the morning when you get up. It’s there even five minutes before your heart attack, before you die. Just five minutes before the car accident in which one is going to die, this concept that “I’m going to live for many years” is there. So it's not true, it cheats, it's defeating. It blocks, it hinders you from thinking of Dharma. From your side you have to make preparation for a free death, for a happy death. [This thought of permanence] blocks you from making preparations for a good rebirth in your next life, so that right after this life you have a good rebirth, are born in the pure land of the Buddha where you can become enlightened, become a great bodhisattva. To have a happier life or a better rebirth with more opportunity to practice Dharma, to meet the teachings of the Buddha. Even just simply to have a good rebirth, a happy life - it blocks you from making preparation for that by practicing Dharma, and it blocks you from practicing Dharma to actualize the path, to cease the delusions, karma and from liberating yourself from the oceans of samsaric suffering, from achieving ultimate happiness. It blocks that. It blocks you from actualizing bodhicitta, from having realizations of the Mahayana path, it blocks you from achieving enlightenment, it blocks oneself from enlightening numberless other sentient beings, to liberate them from the oceans of samsaric suffering, and bring them to full enlightenment. So it’s not true. That concept is not true. It deceives you, it cheats you, if you believe in that. Then suddenly one day, death comes. Rinpoche goes on to give several examples of people recently passing away that were well known to the audience. In general, Rinpoche is giving an outline about how Buddhist practioners of the Mayahana train to think about death and the surety and finality of it. It is said that the only thing that can help us at that moment of death is Dharma. Dharma is the ultimate refuge for Buddhists at the moment of death. It is the only thing which will subdue the terror and fright that can come to ordinary beings at the moment of their own death. Then one day it becomes one’s own turn. Then others one day, sooner or later, hear your name with the word ‘dead’, ‘died’ joined after your name. For example, let’s say Zopa. After the name ‘Zopa’, then add the word ‘died.’ So up to now we hear about others, but sooner or later others will hear your name joined with the word ‘died.’ So sooner or later, that definitely happens. Sooner or later, one day, dead - daytime or nighttime, one day that happens. You want to go shopping for food for this week, and then death happens, you are unable to return back home. Death happens like that. Or you’re cooking food and before you put it on the plate to eat it, death happens. Or you start to write a letter, and before it is finished, death happened. Or you start to write a book, then before finishing the book, death happens. You go traveling, on pilgrimage or vacation, then death happens before coming back. Even while one starts to eat food, before finishing the food on the plate, the soup in the bowl, before finishing that death happens. You go to the bathroom, but before returning back to your room, death happens. So it’s definite that one day you’ll be doing something, and death will happen. It’s for sure. That day is going to come sooner or later. One day your body will be called ‘corpse.’ Corpse. Even normal family members, very close friends, they will not come near or they won't touch it. Our body will be covered with cloth. One’s own body, this body will be on the fire. They will see the skull, see some part of the bones. Or the body will be in the coffin buried in the ground, the graveyard, some flowers put around, and your family members crying, the loved one's family members crying. There’s nothing that can be done - you know that you’re going to die now. Now death is happening, and you know that you’re going to leave, you’re going to separate, you have no choice, there's nothing you can do. No choice, you have to separate from all these loved ones, family, friends, you have to separate from them. And from all these possessions, Mercedes car or limousine. Whatever possessions you have, you know that everything has to be left. At that time the only thing that can help is Dharma, if you practiced Dharma in life. So how can Dharma help us at this time? That helps, the virtue. How much good heart you practiced in daily life, it helps at that time. How much patience you practiced in daily life, it helps at that time. How much kindness you practiced to others, it helps at that time. Dharma is the only thing which at that time can help you not to suffer, to have a happy mind. For the best practitioner of Dharma, they experience unbelievable happiness, joy at the time of death. They can go to a pure land where one can become enlightened. By being born there, then one develops attainment, then one is able to offer deep benefit to other sentient beings, to reincarnate with free will, with total freedom to come back into the world only to benefit sentient beings, to come back with total freedom into the suffering world to liberate beings. As it’s mentioned in Liberation in the Palm of Your Hand, you are so happy, for example as if you haven’t met your parents for so many years and are now so happy to be meeting your parents. Or as if you are going for a holiday after working so hard for so long without a holiday and now you are going for holiday, so are incredibly happy. For the best Dharma practitioner, that's the happiness they experience at the time of death. Then the middle Dharma practitioner's death is full of confidence in the heart, when you die there is full confidence that you will have a good rebirth. Full confidence and a happy mind. For the last one, the lowest Dharma practitioner’s death, there is no fear, even though it is not clear where one is going to reincarnate, still there’s no fear that you will be reborn in the lower realms. So without this inner professionalism, the inner profession of the healthy mind, the pure mind which is Dharma, the real Dharma, so without this, no matter how much you’re externally professional, life problems go on more and more. And what is inner professionalism as opposed to external professionalism? ... if they are missing the inner profession then what is missing is mentally how to live life, how to do everything. The real profession is missing. That is the positive attitude, living life with this peaceful, happy, healthy mind, non-ignorance, non-anger, non-attachment, and especially with the thought of cherishing others, the ultimate good heart, the thought of cherishing others, unstained by the self-cherishing thought, the selfish mind. 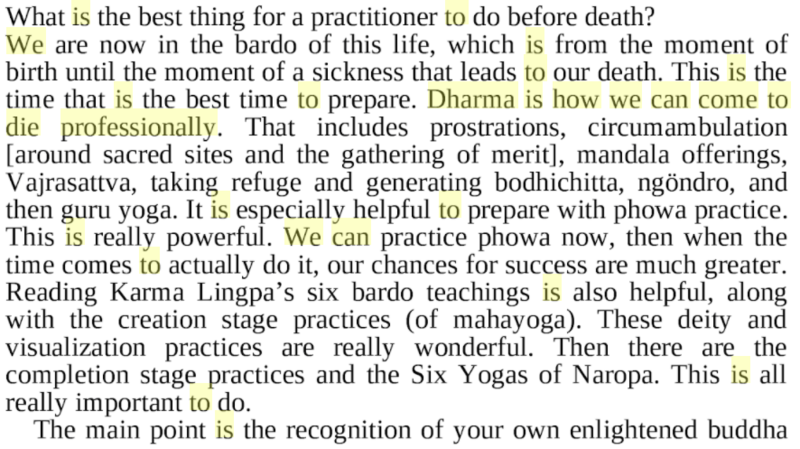 So I think Lama Tharchin is exactly right: Dharma is how we can come to die professionally. This is just so, and not a tad otherwise. -- this is called to die in suchness, or to die professionally. Suchness is a state when our mind has no conflict between "the ought" and "the given". If what you're "given" is death, and you take it as such, without projecting any "it ought to be otherwise" - then you die in peace. This is called "to die professionally" - because as a Buddhist you were supposed to practice suchness (tathata) until it became natural, so by that moment you are a professional "suchnessin" (tathagata). Does Mahayana Buddhism discourage attaining enlightenment under the Gautama Buddha Sasana? What is the intermediate state before birth (Gandhabba)? How does the Dhamma reconcile slavery? How does one become a “Māra”? How important is the surangama sutra in cotemporary buddhism? How are the importance of sutras determined? How Atheism and Buddhism are different? How to develop Equanimity or Upeksha? How should one be mindful of death? How can I tell the difference between the Deva realm and the Buddha and bodhisattva realms?